This document workflow management case study outlines the powerful features found in the print management software solution known as OM Plus Delivery Manager. Customers looking for a solution to remedy the excessive waste in their work order package process and eliminate timely delays will find OM Plus to be a powerful , feature rich solution for overcoming document output challenges. OM Plus Delivery Manager is able to recognize, parse, cleanse, apply page numbers, duplex, staple, assemble, hold for release, and delete obsolete versions of work order packages. Customers are able to select their current job through an on-demand interface on their printer’s touch-screen. When the customer is ready, they simply select the appropriate work order package and it prints immediately. 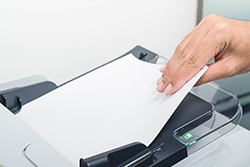 This custom solution allowed for a significant reduction in paper and toner consumption and dramatically improves the workflow efficiency. This solution pays for itself quickly. This type of solution can be customized to meet the needs for anyone experiencing document workflow issues. Whether it’s printing work orders, labels, pick tickets, invoices, assembly instructions, manifests, bills of lading, material safety data sheets and compliance documents, OM Plus can streamline the document workflow process to meet production deadlines, collection cycles, ensure the delivery of mission critical documents and save on cost.